There are very few seven-figure online slots jackpots out there but Lucky Club Casino has just given online casino players another million dollar jackpot to shoot for. LuckyClub.eu is pleased to bring it to present the new Monster Millions slot machine (which currently has a progressive jackpot of just over a million dollars) alongside 30 other completely new online casino games. Monster Millions may be their biggest jackpot but it's certainly not the only jackpot to be won at Lucky Club. Several of the slick new casino’s new games feature the Jackpot Pyramid bonus game which keeps the monster fun happening longer and can multiply wins. Many of the casino’s slots games have random Major and Minor jackpots. The million dollar Monster Millions Jackpot can be won with five of the scattered Moon symbols on a spin during the Monster Mania free game feature. The feature is triggered when a Moon symbol appears on both reels 1 and 5. The free game round takes players to a seemingly quiet bedroom where they select from seven hiding places in search of three Monsters. Prizes are tripled during free games (except the Monster Millions Jackpot) and there are also Monster Bonuses to be won. Bebo and Tang, two animated monsters, are Wilds and can multiply prizes by up to 6x. The Monster Bonus is triggered when either of them appears on reels 2, 3 and 4 giving a bonus prize up to 500 times the triggering slot bet. Like many of Lucky Club’s new games, Monster Millions includes the Feature Guarantee which ensures that either the Monster Bonus or Monster Mania Feature will be triggered within a given number of spins. Using the Instant Trigger option, players can try to trigger these features at any time. In addition to Monster Millions, Lucky Club Casino (www.LuckyClub.eu) has 30 video slot machines, three video poker games (Deuces Wild, Jacks or Better, Joker Poker) and four table games (Baccarat, Blackjack, Let ´em Ride, Tri Card Poker). New online slots African Skies, Greek Goddess and The Duck Ages feature the 5-level, interactive progressive jackpot game “Jackpot Pyramid”. 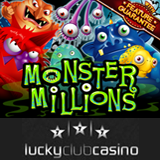 Wow, what a huge jackpot to be won on the Monster Millions at Lucky Club Casino!